You have a sauna at home or you are about to buy a new one. Then it’s just as important to think about what kind of sauna rocks you should use for your sauna. Here is a simple guide to choosing the best sauna rocks and stones for your new or existing sauna. What Are Sauna Rocks? Why Do I Need Them? Sauna rocks play a very important role for your sauna – by absorbing and keeping in heat. Saunas work by heating up the rocks using a wood fire or an electric heater, and once these are turned off, the rocks keep the room nice and hot. The advantage is that you can maintain the sauna at a certain temperature, and save energy at the same time. Splashing some water on your rocks will cool them down, but also provide you with a bit of humidity in the form of steam. What Are the Best Type of Sauna Rocks? There is a good argument that Igneous rocks, otherwise known as volcanic rocks, make the best type of sauna rocks. Granite rocks, which are from the Igneous family, are a good option as they have better thermal mass. This means they have a greater ability to absorb and store heat energy, creating a better sauna experience for you. It is important though to select non-porous granite rocks (with no cracks or crevices), as porous rocks will absorb water. This may even cause them to burst or explode when exposed to high heat. Rocks from a lake which have a nice smooth surface will be less likely to have many cracks and surface imperfections. What Size Rocks Should I Get? The rocks you choose shouldn’t be too big or too small, about the size of a medium potato should be fine, or somewhat bigger than a golf ball. Too big, and the rocks take too long to heat up. Too small, and they heat up too quickly. Because small and big sauna rocks typically react differently to getting water splashed on them, it’s recommended to have a mixture of small and somewhat larger sauna rocks. But don’t go bigger than the size of a softball. You don’t actually need a large amount of rocks either, as you want to sit them loosely on top of your sauna heater to let the hot air circulate freely between them. How Often Should I Replace My Sauna Rocks? How often you replace your sauna rocks depends on how often you use your sauna. 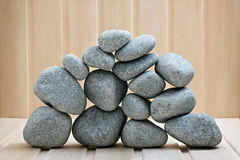 Before deciding to replace your rocks, you can re-arrange the position of your rocks on the pile regularly. This will help to provide better air circulation, and to rotate which rocks are sitting at the bottom of the pile, as these rocks will be sitting closest to the heater, and will likely disintegrate faster than the rest. A good rule of thumb for when you will need to replace your rocks is if you are using your sauna once a week, replace your rocks once a year – twice a week, twice a year and so on. How Much Water Can I Splash On My Sauna Stones? It’s very tempting to empty a whole bucket of water on to a sauna stove and enjoy the massive burst of heat that gets created. It’s vital to splash water in smaller portions, for multiple reasons. You know that big wave of steam you get when you throw water on sauna stones? In Finnish, that is called Löyly. The fact that there is even a name for that sensation means there are some tricks you can learn to get the best Löyly possible. Splashing cold water on the rocks will give you a better Löyly sensation (as you get a lot more steam), but if you do this too often, or with too much water, you risk cooling the rocks too much or flooding your sauna heater. It’s great to have that heat sensation when throwing water on the heater/stove, but if you use too much water in one go, the sauna stones cool off and your sauna session becomes counter-productive. It’s essential to find a balance between creating heat while not cooling off the sauna rocks too much. 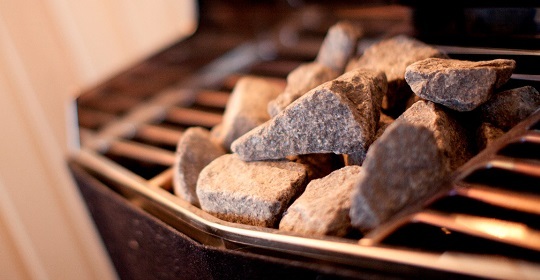 This way, your rocks and stove will suffer less fatigue and will simply last longer. Another option is to use slightly warm water. This doesn’t cool your sauna rocks as much, but you get less steam and therefore less Löyly. But it’s definitely worth trying as using water on sauna stones (how much and what temperature) is very much a personal preference. The best method however, is perhaps to stick to cold water, about 3-5 oz at a time, and splash the rocks once every session. A session in this case means the uninterrupted period of time you are in the sauna. Another thing to keep in mind is that it’s recommended to start with smaller amounts of water at the start of a sauna session, to allow the sauna rocks and the sauna stove to properly heat up first. This way you won’t shock your sauna stove too much. If you are spending approximately 15 minutes in the sauna at a time, but you are coming in and out 4 times (4 times 15 minutes), you would typically splash the rocks 4 times in total, once every 15 minutes. Finding the best sauna rocks you can afford and treating them well are pretty important to maintaining a great sauna experience. Go for nice round rocks that you can rotate regularly. And as long as you don’t flood them with water, you will be able to enjoy your sauna and your sauna rocks for many years to come.